This lesson explores several important concepts of long tail keywords including the definition, framework, common mistakes and how to use them. Search Engine Optimization is all about using the right keywords. Since the time the concept has existed, marketers and website owners have focused their efforts on getting the right keywords for their business that will effectively increase traffic and in turn increase conversions leading to a higher ROI. To clearly understand long tail keywords, it is essential to have a strong understanding of what theme keywords and category keywords are. 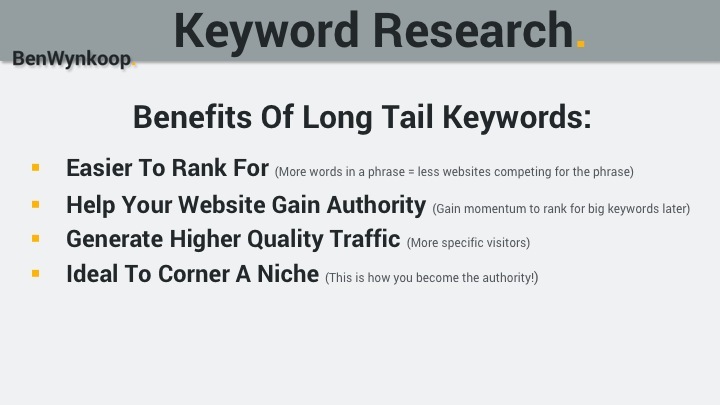 Targeting long tail keywords often provide several benefits including more attracting specific visitors, being easier to rank, helping build the authority of your website and providing opportunity to dominate a niche. Being highly specific, long tail keywords tend to draw less quantity, but higher quality traffic that is more effective in garnering conversions. Incorporating long tail keywords can, in the long run, prove to be less expensive, especially in the case of Pay-Per-Click (PPC) advertising—the more words in a phrase, the lower the amount of of websites competing for that term. A website can build authority to rank for category and theme keywords in the future by first ranking for the lower competition long tail keywords. They are also the best when you have to drive or corner a market that is smaller, but has as much potential as other large markets. One mistake marketers make is not investing much time in targeting ‘long tail keywords’. 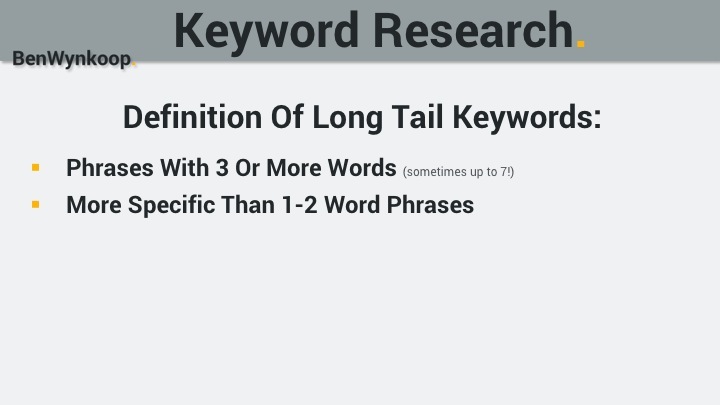 To be able to effectively use them, it is essential to understand what long tail keywords are and how to use them. A common mistake in the keyword selection process is getting overzelous and immediately targeting the category and them keywords. Long tail keywords are used to refine the search terms to the webpage and even when you are looking for something more specific. They work just like the normal keywords, and are used to define the contents of the webpage they are attributed to and even what the website owner intends the search engines to find on search engine pages. After conducting thorough keyword research and organizing a report identifying which keywords not only have acceptable search volume, but also acceptable competition in organic search, begin your campaign first by targeting long-tail keywords before trying to dominate the rankings for category and theme keywords. 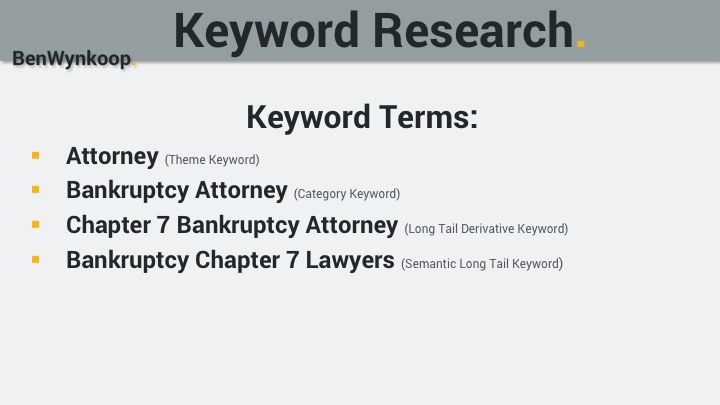 To give an example of how I would use the long tail keyword examples mentioned above to optimize an attorney’s website, I would first create a page about his or her practice area of bankruptcy to target “bankruptcy attorney”. Secondly I would create pages targeting the different types of bankrupty solutions offered. For example, one page about chapter 7 bankruptcy, targeting the long tail derivative keyword “chapter 7 bankruptcy attorney” and additional pages targeting each other type of bankruptcy the lawyer specializes in. After this initial phase is completed you could opt to create additional informative pages targeting your remaining list of keywords. Unleash the entire arsenal on your report by creating multiple pages to act as an online guide or academy and you will be well on the way to being the authority in your niche! Go after the low-hanging fruit to build the authority of your website before trying to hit a home run. Overall the process of search engine optimization is a snowball effect, so start modest. Good luck and please reach out to me with any questions or comments below.